When should I start shopping for my wedding dress? When is it too soon or too close to the day? There’s a lot that goes into purchasing a wedding dress. So we've created a timeline to help you get off to a good start. After you’ve set your budget, start browsing wedding dress styles online to get a feel for styles that you like. Get inspiration on different looks before you make your bridal appointment. This will also help you in requesting the style of gowns that you would like to try on at the bridal salon. Grab your girls and start shopping! One thing we would recommend: Keep your entourage small. Everyone will have a different opinion and this may cause some unnecessary stress and a deviation from your original vision. Try on several styles and not only those that you have favored. Often times, girls find “the one” and it is a completely different style than they had original set out for. So try on as many styles as possible. It’s part of the fun! It can take up to 6 months for bridal salons to order your dress and have it delivered to their shop. Don’t push it. You'll also need to take into consideration your bridal fittings. It can take up to 3-4 fittings to alter your dress. So around the 8-9 month mark, you should have a final decision and deposit placed on your gown. Start shopping for accessories, shoes and undergarments. *You will need your shoes and undergarments for your bridal fittings. If you are having a destination wedding, start calling the airline to find out if they have stow closets near the cockpit and/or what their carry on restrictions are. 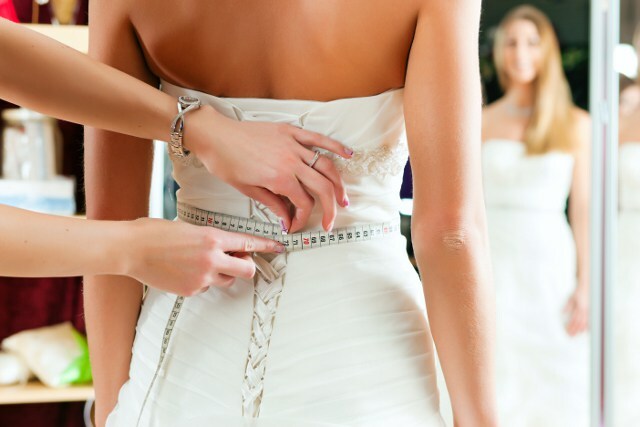 If you’ve decided to alter your dress with the bridal salon where you found your dress, they will schedule your first fitting around this time to allow for changes in measurements and ensure a proper fit. If you chose to do your fittings elsewhere, start making those appointments around this time. Your second and final fittings will take place within this time frame. This will allow time for your seamstress to make minor alterations after your first fitting. Take your dress home in a garment bag. We recommend using a breathable non-woven garment bag. If you have a veil, hang it with your dress to prevent wrinkles and the possibility of leaving it behind. Choose a spot for your dress away from possible accidents. Avoid storing it in heavy traffic areas. Now is a good time to get your dress steam cleaned.